In March GBCT reaches its third anniversary. We’ve set many milestones during our first three years, not least that we have now awarded over £43,000 in grants. 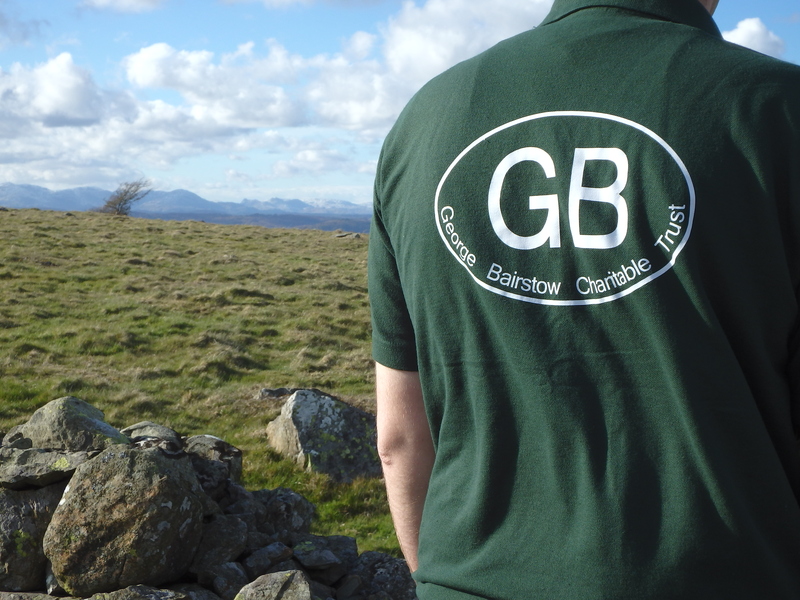 The GBCT has, and continues to, support communities across the UK in the provision of emergency aid, volunteering and the development of skills in young people. Our latest round of grants total in excess of £6000 and you can read all about them both below. Thank you to all our supporters who have made our achievements possible. GBCT’s latest grant is to Surrey Search and Rescue, a charity which exists to support the emergency services in the search for missing children and vulnerable adults. The team of 75 volunteers is trained in rapid searching techniques and navigation to cover Surrey’s extensive rural land effectively. A member of the UK’s Lowland Rescue Service, the team have already been called upon over 400 times in their 6 year history. GBCT has awarded a grant of £800, which will enable the purchase of first aid kits to be provided to every team member. Often working in difficult to access areas, the kits will support the team, who are all trained in first aid, in providing potentially life saving first aid safely and effectively whilst awaiting the arrival of further assistance. You can follow the work of Surrey Search and Rescue by visiting their website www.sursar.org.uk or following their Facebook page. In our last newsletter, we reported that All Saints Church in Weston, Surrey, was soon to be running community first aid sessions with help from GBCT. All Saints installed a British Heart Foundation supported AED last year and GBCT provided a grant for a member of the Parish team to be first aid and AED trained. Volunteers Iain Bennett and Matthew Leopold have now delivered a series of AED awareness sessions to over 30 members of the church and local community. After a busy day, Iain commented that “an AED is simple to use, yet it can save a life in the event of a cardiac arrest. It was a pleasure to visit Weston and give the community the confidence to use this brilliant piece of equipment”. JW took a parenting skills course and described how he now knew ‘how to raise a responsible, polite, healthy child who will become a responsible member of society and will give so much to a community’. SG took a learning to learn course and wrote that ‘I now know if I reach an impasse when studying due to myself not comprehending specific components, I can apply the skills I’ve learnt to overcome and study effectively’. The volunteers at Ulverston Inshore Rescue have been making good use of their GBCT supported 4×4 response vehicle. The team have posted a few pictures on their Facebook page of recent rescue and training operations, including the new vehicle with the team’s rescue hovercraft. In this case, the team supported Furness Coastguard in searching for a crashed paraglider, which they were thankfully able to confirm as a false alarm. Supporting both the enhancement of skills and volunteering among young people, the Helston Railway Preservation Society has been awarded a £3400 grant towards its Juniors Day Project. Set up 12 years ago, the Society aims to re-open a section of the Helston branch line and, by this, re-introduce engineering skills to Cornwall with a particular focus on young people, so they consider engineering when making further education and career choices. The Juniors Day Project builds on the work the Society has done with Duke of Edinburgh Scheme participants, the Prince’s Trust and Cornwall College. It will be an ongoing project that will provide a monthly opportunity for up to 20 young people at any session to gain work experience in an engineering environment. GBCT’s grant funds the majority of the Project’s start up costs, including safety equipment, tools, materials and travel costs. George himself was an engineer, studying engineering at Durham, so the GBCT is particularly pleased to be supporting the Helston Project. You can find out more about the Society and their work with young people at www.helstonrailway.org. The enhancement of skills among young people is the aim of Armonico Consort’s educational outreach programme, AC Academy. Armonico Consort is a critically acclaimed choir, orchestra and opera company, whose Academy provides free music education to young people across the UK. The aim of the programme is to nurture and harness the talent and prospects of young people, many of whom come from disadvantaged backgrounds, inspiring a passion for music and performing arts, driving ambition, and providing life-changing training and performance opportunities. GBCT is run entirely by volunteers, so to recognise their work, and hopefully inspire others to get involved with GBCT, we’re launching a new feature in our newsletter. In this edition, meet Matthew Leopold, who is one of our founding Trustees and was reappointed at January’s Trustee meeting for a further 3 year term. Matthew met George at Durham University through St John Ambulance (SJA) and continued to work with him in SJA’s Medical Response Team in London after university. Matthew is currently the Trust Secretary and, amongst other duties, keeps the minutes of the Trustee Meetings under Vivian’s watchful eye for grammatical correctness! Matthew’s SJA experience means he is also a key part of our first aid outreach work. Day-to-day Matthew works in marketing in Surrey and regularly shares his expertise for the benefit of the Trust. In our next newsletter, meet Faye, the inspiration behind GBCT’s social media pages. Once again we’d like to say a big thank you to all of our supporters. Over the Christmas period approximately £1000 was received in donations of various amounts from GBCT supporters. 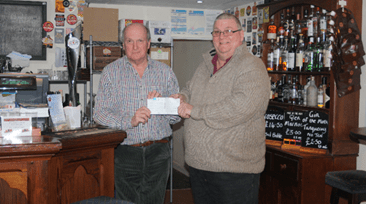 GBCT also received a donation of £100 from the Christmas raffle at Brompton-by-Sawdon’s Old Post Office Tavern in December, followed in January by a donation of £200 from the Scarborough Dine and Dance Club. Neil Sands runs both the Tavern and the Club and is pictured below in the Tavern presenting the cheque to Vivian, George’s father. GBCT relies upon the generous donations of its supporters and the Trustees would like to thank all of GBCT’s donors.